Security Bugfix Release LEPTON 4.2.0. This is a Security Bugfix Release of LEPTON which also contains some maintaining items. After nearly one year of coding we are happy to release LEPTON 4.0.0 as Stable Version today. New LEPTON 3.0.3, a bugfix and maintain release, is published today as stable version. Time runs out: new EU cookie law starts in May 2018. New LEPTON 3.0.2, a bugfix and maintain release, is published today as stable version. Please keep in mind, that you have to edit your groups access after upgrading from a 2.4.1 to 3.0.0 or 3.0.1 for there had been massive changes in this item. After fixing some bugs we are happy to release LEPTON 3.0.1 as Stable Version today. What is done in LEPTON 3.0.1? After more than another 130 commits we are happy to release LEPTON 3.0.0 as Stable Version today. We are happy to release LEPTON 3.0.0 as Release Candidate 1 today. We have been developing the release 3.0.0 for more than 2 years and some parts have been already released in current or older LEPTON versions, such as setup.ini or LEPTON autoloader, just to enable easier upgrade from LEPTON 2.4.1 to 3.0.0 . We are sorry but today we got knowledge of a very important bug (highest level) in LEPTON 2.4.0. Affected are all releases 2.4.0 and they need a very urgent update. We are happy to release LEPTON 2.4.0 as Stable Version today. Notice: beneath maintaining tasks there are some new interesting things for addon developers! What is done in LEPTON 2.4.0? The authors of PHPMailer published vulnerabilities on their wiki. Please read details if your LEPTON installation is affected. We are happy to release LEPTON 2.3.0 as Stable Version today. Notice: we got again several vulnerabilities fixed in 2.3.0., so we strongly recommend you to update to current release! LEPTON mobile package is from release 2.2.2 ( from 08-12-2016 ) already available with PHP 7. So can easily try if your installation is runnung well without notices or errors with PHP 7. We are happy to release LEPTON 2.2.2 as Stable Version today. Notice: we got vulnerabilities fixed in 2.2.2., so we strongly recommend you to update to current release! What is done in LEPTON 2.2.2? If you use a webspace or dedicated server you may have noticed, that more and more provider are upgrading their php releases to php 7.x. There are some hosters that invoice you some money as a support fee if you want to stay with php5.x ( up to 6 EUR a month), other hosters upgrade to php 7.x after they informed their customers via mail. We are sorry but there is an important bug in LEPTON 2.2.0. All those who are working with frontend login or frontend register should use this bugfix update to release 2.2.1. We are happy to release LEPTON 2.2.0 as Stable Version today. What is done in LEPTON 2.2.0? We are happy to release LEPTON 2.1.0 as Stable Version today. The Upgrade Package to LEPTON 2.0.0 is available. Please keep in mind, that upgrade is only possible from LEPTON 1.3.2. From today the LEPTON 2series will replace the LEPTON 1series. LEPTON 2.0.0 stable release has been published today. After a few bug fixes in the beta version and a reworked installer the aim of this RC is now to present a stable LEPTON 2 in January 2015. First step is done. Pre-Release LEPTON_2 beta is published. We hope that you will test this prelease intensively so we can prepare next release as RC. 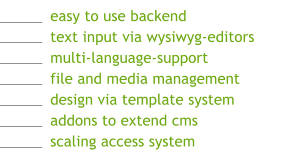 With the help of these Upgrade-Scripts you can modify your WebsiteBaker Installation 2.8.1 or 2.8.3 to LEPTON 1.3.2 . This version is the follower of LEPTON 1.3.1 . The main task was to fix small bugs in the database connector "pdo_mysql" and to set a solid base to upgrade to LEPTON 2.x which will hopefully be released in the near future in beta state. Today some bad news reached us. Ralf Hertsch, co-founder of LEPTON project passed on 29. September 2014. This release is the follower of 1.2.2 and a bugfix/maintain release. We announced in November 2011 that we will maintain LEPTON 1 series up to 30th June 2013. Though LEPTON 2 series will be released as a BETA in August (hopefully) we will extend the maintainig of LEPTON 1 series to 30th June 2015. If you got problems with the addon file editor within your installation after upgrading to release 1.2.2. they may be caused by modified jquery core file 1.9.1 in current release. This release is the follower of 1.2.1 and not only a bugfix / maintain release. This release is a bugfix / maintain release and the follower of 1.2.1. This release is a bugfix / maintain release and the follower of 1.1.4, but because of some database modifications it is named 1.2.0. It includes latest Tiny_MCE, some bugfixes and more. We're proud to announce the first alpha release of upcoming LEPTON version 2.0.0! On January the 25th 2012 we had been informed that LEPTON contains some security issues, effected are all existing releases. All announced issues can be fixed with an update to LEPTON 1.1.4 so we strongly ask you to update all installations. We are looking for helpers who would like to translate LEPTON core language files to ES and PT. Volunteers who are willing to do this this please contact us. Also other translations and translators are welcome. The new release LEPTON 1.1.3 is available at the download area now. We currently start the tests for LEPTON 2.0. We have promised to enable users a futureproof and safe use of each LEPTON version. Although we are currently working hard on the first release of the 2.x series, it is important to acknowledge the continued support for the previous version. The new release LEPTON 1.1.2 is available at the download area now. Frank has improved the upgradescript from WebsiteBaker to LEPTON. All details about current release 2.0 can be found on this page. The new release LEPTON 1.1.1 is available at the download area now. A new beta of the upgradescript from WebsiteBaker to LEPTON was released. Please find all details on this page. LEPTON is now listed on opensourcecms.com. Yesterday the idea came up to create a QR-Code with a LEPTON logo. Due to many bugfixes, some security audits (many thanks to Hans) and the neccessary code changes we also had to modify the database. Even though LEPTON ins't released stable yet the first LEPTON Template is published. To our own surprise there were only less bugs to fix but among them one big bug relating to external addons within the wysiwyg module. But this one was fixed too and also tested by the "bugseeker". Please download the release candidate 4 and we hope, the next release will be the stable. After lots of bugfixes - who wonders after more than 550 revisions - the Relase Candidate 2 is available for testing.